Glenn Zaleski is one of the most in-demand pianists on the New York City jazz scene. Originally from Boylston, MA, Glenn has made a name for himself playing with the likes of Ravi Coltrane, Lage Lund, and Ari Hoenig. His most recent album, "Solo Vol. 1", was released in early 2018 - his first solo piano album, as well as the first release from his own label Stark Terrace Music. In 2017 he released his second album for Sunnyside Records, "Fellowship", prompting All About Jazz to note, "Glenn Zaleski has quickly become one of the most important pianists of his generation and it's easy to see why." 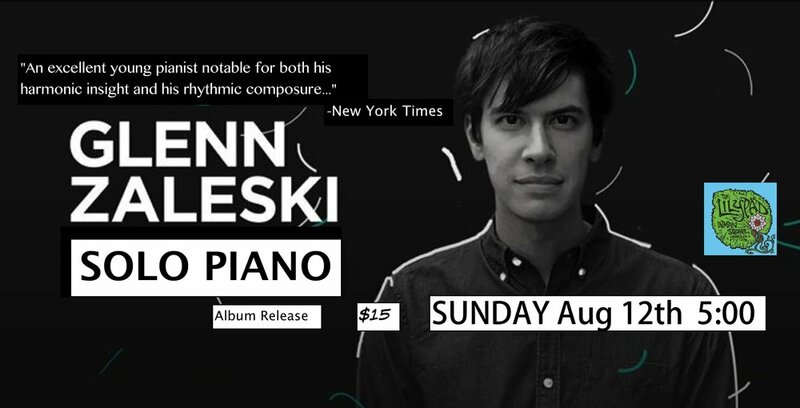 His debut album, "My Ideal", was released in March of 2015, also on Sunnyside, and received critical acclaim: Downbeat Magazine named it "sublime", Jazz Times called it, "an engaging set by a talent worth watching," and the New York Times named the record a "strong statement," praising its "fluent but unhurried sense of phrase".